This fully lined hunting coat is made of tightly-woven, industrial strength cotton that's been treated for water repellency (comes with Oil Finish Wax for care). Front- and side-loading game bags have a blood-proof, washable liner with an interior button opening for easy cleaning. The expandable bellows pockets have loops for shells and drainage grommets. The action back design provides a full range of motion through the shoulders. 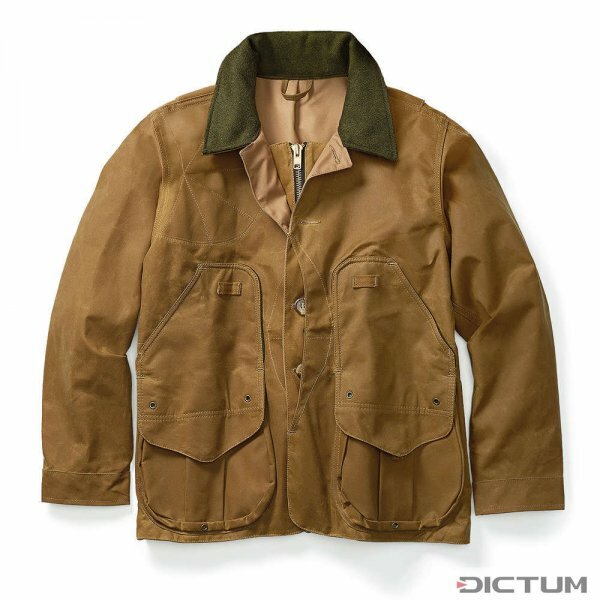 Transmitter loops, a shooting patch, a wool-lined collar, handwarmer pockets and other details keep this hunting coat functional in all weather and environments. Due to its short cut, this Filson classic can also be worn with waders or a waist bag. The loose fit allows several layers to be worn (»onion principle«).